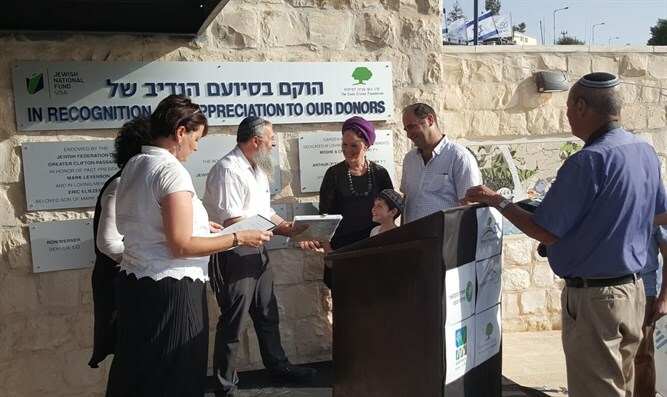 'The Boys' Promenade' for three murdered teens inaugurated in Gush Etzion together with 'Ezra's Lookout' in memory of Ezra Schwartz. The "Boys' Promenade" was inaugurated in Gush Etzion on Tuesday in memory of the three youths Gilad Sha'ar, Naftali Frenkel, and Eyal Yifrah Hy"d who were kidnapped and murdered. Also dedicated was the "Ezra's Lookout" lookout point in memory of Ezra Schwartz Hy"d, a young man from Boston who was killed in a shooting attack in the same area two-and-a-half years ago. The ceremony was hosted by the Gush Etzion Foundation and was attended by representatives of the families with the participation of Gush Etzion Mayor Shlomo Ne'eman, MKs Shuli Mualem and Yehuda Glick, Etzion Commander Major Yisrael Ankri, WZO Development Division Chairman Gael Greenwald, and JNF Chief Israel Officer Eric Michaelson. The promenade connects Rosh Tzurim to Alon Shvut, while on the road facing the Judean plain lies the lookout, with the Carmei Gush Etzion vineyards in the background. The observatory features mosaics created by resident artist Rachel Ben Asher, who commemorates Ezra Schwartz and the three boys. "We're in a week when we switched 'On the rivers of Babylon there we sat and wept' with 'Song of Ascents, when the L-rd brings the return to Zion'," said Neeman. "We're at a very special junction that could only be born in Gush Etzion. A junction where the Boys' Promenade connects to the Path of the Patriarchs. We often sow with tears to harvest in joy. Here we're able to walk with all our strength and full force on the Path of our Forefathers and we don't forget to walk on the Boys' Promenade." World Zionist Organization Settlement Division Chairman Gael Greenwald said "the message the families conveyed throughout the difficult period was a message that we're one family, and that's the true repair effected by the three weeks that we passed. We take it with us, it's hard, but that's the Torah passed on to us. We are one nation not only in words but also in action." Racheli Frankel, Naftali's mother, spoke on behalf of the families of the youths and said, "Gush Etzion has a glorious and tragic tradition. Thousands of people have given themselves up to this land. In the past four years, Gilad, Eyal, Naftali, and Ezra have also joined this 'glorious club' whose blood is absorbed in Gush Etzion. "Communities around the world have joined together in the unity, the mutual care, youthful innocence, and the values of our children, and said that they too want to be part of Gush Etzion. The success of the Gush Etzion victims is the life here, the flourishing Torah, the unmatched communities," added Frenkel. Knesset Member Shuli Mualem (Jewish Home) said "The physical characteristics of the promenade and lookout are the way, the view that emerges from here, and the spirit of Gush Etzion, which is of great importance to us not only for the results but also for the path. And this path is the same path that we learn from you, the families; the memories we hear about the boys, their devotion, their friendship, the way they wend and chose to go, we want to connect to this path. "In the 18 painful and impossible days of the boys' kidnapping, we heard your ability to see far, see yourself as part of a whole and still show us your personal son. And the spirit that you carry with you to us is a spirit of devotion to one another and mutual responsibility, a spirit of commitment to the Jews in Israel and throughout the world. A spirit that says we're part of the same chain of fathers who began to walk here and sons who continue this path," added the Knesset member.